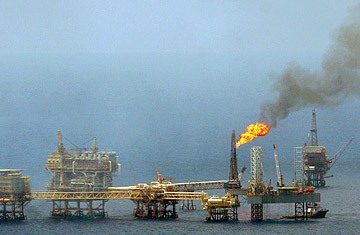 A PEMEX (Petroleos Mexicanos) oil rig of the coast of Campeche, Mexico. For months, the debate over opening up Mexico's petroleum industry to foreign companies raged in the streets. Thousands of riot police held back screaming protesters from invading the Senate. Mammoth rallies screamed that the president was a puppet, selling its nationalized oil wealth out to the gringos. Banner-bearing lawmakers opposed to the president's proposal camped with sleeping bags on the podium of Congress, shutting down the legislature for weeks, as the arguments went back and forth, for and against giving international oil giants the right to sink deep wells in Mexican territory and waters, long the sacrosanct monopoly of the country's national oil corporation. The result is this week's watered down energy reform legislation, supported by the govenrment and most of the opposition. It amounts to far less than the hungry companies had hoped for when President Felipe Calderon first floated the idea of opening up the oil industry in January. There are no sweeping constitutional changes to allow foreign corporations a share in the deepwater reserves in the Gulf of Mexico, which may hold as much as 50 billion barrels. Nor will the trans-nationals be able to build and run refineries on Mexican soil as Calderon proposed in his bill filed in April. The thrust of the new law approved Tuesday is simply to allow government oil monopoly Pemex to subcontract foreign companies to explore and drill in specific parts of Mexico. Furthermore, crucial clauses allow Pemex to be able pay those companies by performance. However, analysts say that for Calderon to be able to touch the sacred cow of Mexican oil at all is a major advance, which could open the door to deeper changes in the following years in Mexico, the third biggest supplier of crude to the United States after Canada and Saudi Arabia. "The law creates a very important framework on which more regulations can be developed," said energy analyst David Shields. "It allows for contracts with foreign companies that can be much more flexible than anything we have seen before." Pushing for an oil law was always a tough bet for the conservative Calderon, who has promised a series of reforms to modernize Mexico. When the petroleum industry was expropriated from American and British companies in 1938, it was trumpeted as one of the great gains of the Mexican revolution. "The oil is ours," cheered millions in celebrations across the country alongside promises of riches for all. Seven decades later, leaders used the same slogans to defend a state oil monopoly more closed to foreign investment than even that of Cuba or Venezuela. Spearheading the opposition was Calderon's old nemesis Andres Manuel Lopez Obrador, a silvery-haired leftist who lost the 2006 presidential election to the conservative by a whisker. Lopez Obrador contended that Calderon had been spuriously placed in power so he could loot Mexico's treasure trove of black gold, which provides the federal government with 40% of its budget. When Calderon tried to push through reform in the spring, Lopez Obrador directed lawmakers from his party to occupy the podiums of Congress for several weeks, until the government conceded to a national debate. After a Congressional commission finally hammered out the watered-down consensus bill this month, Lopez Obrador still insisted the government was privatizing, and sent so-called "oil brigades" to blockade the Senate, forcing its members to cast their votes in an alternate venue. "This reform cedes great chunks of our territory to foreign companies," Lopez Obrador told Congress on Tuesday, just before the final vote on the law. "Mexico should go on being a free, independent and sovereign country. We do not want to become a colony." Calderon finally got his reform through by forging an alliance with the moderate wing of Lopez Obrador's party, some of whom have accused the leftist leader of being too authoritarian and confrontational. Following a series of backdoor meetings, the majority of leftist lawmakers not only ignored calls to blockade the podium again but actually voted in favor of the bill. The result was thus seen as a major political victory for the president, who built a consensus on a difficult issue and isolated the hard left. "With this reform the national economy wins; all Mexicans win," Calderon said in a televised message after Tuesday's vote. "And it's particularly important that Mexicans have reached agreement at a time when the world economy goes through an especially adverse situation." But not everyone is optimistic about Mexico's future following the reform. Political analyst Federico Estevez said that it could be too little, too late and lead to major losses in oil revenue before more radical legislation is implemented. Furthermore, he said that far from becoming isolated, Lopez Obrador and the hard left have kept themselves in a powerful strategic position if the global economic woes hit Mexico hard. "Lopez Obrador is sitting pretty for when things go bad for the economy here  and they will go bad," Estevez said. "If people lose their jobs, they are not going to care that Calderon has managed to get a minor oil reform through. They will turn to more radical options."